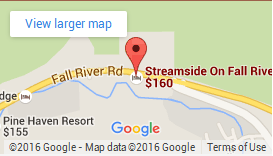 Streamside accepts reservations up to 12 months in advance. All reservations must be guaranteed by a deposit of 50% of the total stay. Payment for the balance of the reservation is due at check in. Deposits may be made by personal check if the check is received by Streamside at least 30 days prior to the scheduled arrival date. We will hold the reservation for no more than 7 days while the check is in transit. Cancellations 15 days or more days prior to scheduled arrival are eligible for a deposit refund less a $50 fee. Cancellations or changes within 14 days of scheduled arrival are non-refundable and the deposit will be forfeited. No refunds or date changes are allowed after check-in. NO SHOWS If a guest fails to arrive on the arrival date of a reservation, the entire reservation will be cancelled and the deposit will be forfeited. If you cannot make your scheduled arrival date but intend to use your remaining hotel nights, please contact Streamside to confirm your actual arrival date. Streamside is a NO SMOKING FACILITY, indoors and outdoors. Smoking is not permitted in the cabins, on decks or patios, or on the resort grounds. A $150 fine per day will be assessed if any signs of smoking are found. Guests found violating this policy may be asked to vacate with no refund. Pets are not allowed on the property. A $150 fine per day will be issued if a pet is discovered in your cabin, reported to our staff, or if we find signs that a pet has been in your suite. Guests found violating this policy may be asked to vacate with no refund. CHECK-IN Check-in begins at 3:00 PM daily. If you will be arriving after the office closes (7pm in winter and 8 PM in summer), please contact the office to make late check-in arrangements. CHECK-OUT Check-out time is 11:00 AM. If you will be leaving before the Front Desk opens, you may deposit your key in the Key Drop box to the right of the lobby door. Any remaining balance on your account (gift shop purchases, etc.) will be charged to the credit card provided at check-in unless prior arrangements are made. Any guest remaining in their room beyond 11:30 am on the day of scheduled departure will be charged a $50.00 late check out fee. PARKING Parking is limited at Streamside. Room rental includes parking for one car per room (Two Bedroom Cabins can accommodate two cars). Short-term visitor parking may be available – check with the Front Desk. All cars must be registered at the Front Desk. Non-registered vehicles are subject to tow. Sorry, we cannot accommodate RVs on the property. CHILDREN Children are welcome at Streamside. Please supervise children at all times on Streamside grounds. Also, please respect the vacations of other guests by avoiding activity near their cabins. HOUSEKEEPING Housekeeping services are provided to each room daily, unless the Privacy sign has been placed on the outside door handle of your cabin. Housekeeping works limited hours each day. Any rooms still exhibiting the Privacy sign at noon will not be serviced that day. If your room has not been serviced, additional supplies (ie. soap, shampoo, coffee) are available from the Front Desk. Daily service includes making the bed, emptying the trash, replacing towels (if on the floor) and replenishing toiletries. Sheets are changed every three nights. HOT TUB The outdoor hot tub is available to all guests. Hot tub towels are available at the Front Desk and must be checked out during office hours. Children must be supervised. Please be gentle with the cover and replace it when you are done. Please do not eat or drink in the hot tub. This is a no smoking area. NO GLASS ALLOWED IN HOT TUB AREA. BICYCLES We do not allow bicycles to be placed or stored inside the cabins. They may be locked on your front or back deck. A $150 cleaning fee will be issued if a bike is discovered in your suite or if we find signs that a bike has been in your suite. DVD RENTALS Streamside offers a DVD library available for guests at no charge. Guests may keep the DVDs for the duration of their stay. If the movie is not returned at check out or found in the room, guests will be charged $25 per missing DVD to the credit card provided at check-in. We understand that on occasion a DVD gets scratched. If a DVD becomes damaged, please return it to the Front Desk and notify the staff of the damage. Thank you! FAX A fax machine is available at the Front Desk during office hours. The fee is $1.00 for the first page and 50¢ per additional page, incoming or outgoing. To receive a fax, please notify the Front Desk first. The fax number is (970) 586-6272. FISHING You are welcome to fish – catch and release – in Fall River on Streamside property. A Colorado fishing license is required and can be purchased at several area businesses. LOST ROOM KEY Streamside uses traditional keys for the rooms. As such, if a key is lost, we must change the lock on the room to ensure the security of subsequent guests. If you lose your key, you will be charged a $100 lock change fee. If you accidentally take the key home with you, you will be provided 48 hours to return the key to Streamside to avoid the lock change fee. OCCUPANCY Each suite has a limit to the number of people occupying the room. Standard room rates are based on two people. The charge for extra guests is $10.00 per person per night, up to the maximum occupancy of the unit. Undeclared overnight guests will be charged $25.00 per person per night. Any violation of the maximum guest policy may be asked to vacate the property with no refund. GAS GRILLS Each unit (except 20A – the motel room) has a grill on its deck or patio. The grills are gas powered (either by a tank or a gas line). The lighter is located under the kitchen sink. Remember to turn the gas for the grill off when you are finished cooking. Please let the Front Desk know if your grill runs out of propane or is not working properly. TOWELS AND OTHER STREAMSIDE PERSONAL PROPERTY Streamside offers many personal items for guest use during their stay, including extra towels, bathrobes, board games and DVDs. These items remain the property of Streamside and should be returned to the Front Desk or left in your room at check out. Do not remove Streamside property from the premises. Missing items will be charged to the credit card provided by the guest at check in, based upon management’s replacement value.